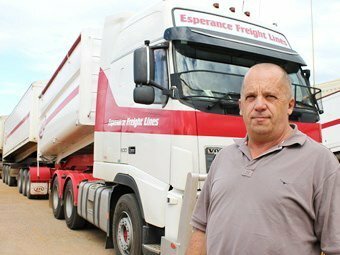 Esperance Freight Lines origins can be traced back to when my father John Harding took over a fruit and vegetable run from Ian Campbell whilst still owning the Shell Distributorship in Esperance. I looked after the Fruit and Veg run until John sold the bus to my sister who expanded from one truck to about 6 to 8 trucks over a period of time and re-named the business to Esperance Freight Lines. During this growth period, Colin Danks and I worked for the business and ran the operational side of the business. Colin & I purchased the business in 2003 and seven years later in 2010, I acquired Colin’s share. We are very proud of the company and have built our reputation on good old fashioned customer service at a fair and reasonable price. I take pride in our staff and have a large number of long term quality staff who helped us build and maintain strong customer base. Whilst Esperance Freight lines has grown into a major player and ranks among top 10 in WA, I am proud that we continue to offer personalised service to our customers. We continue to look for further opportunities to continue a controlled growth pattern for the company.